We are making RECIPES here in DragonLand. You will be given an overall title and three ingredients from which to dream your tag. It's going to be great fun and a real challenge to follow, but we hope you like our next round of inky ideas!! Elizabeth is starting off a great new round of challenges for you. In her dreams she sees masks, and wonder what hides behind them, secrets maybe, who knows! I would like you to include masking, paint and text of some sort, along with at least one real stamp on your tags this time. 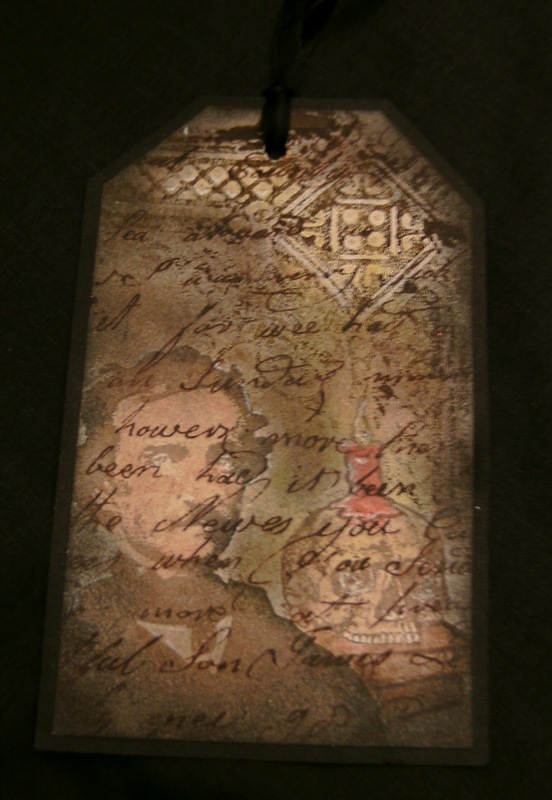 I used a mask, and brown paint over a paper that already had text on it.... i stamped POE and a SKULL from CHERRY PIE ART STAMPS.....coloured the images and my tag with distress inks. I hope you'are up for this recipe challenge.... its a little different...but different is GOOD! I love how Poe is emerging through the tag as a ghostly presence - as if his words are going before him! Very clever! Very impressive example for us, Lyn. You did a great job with old EAP. How cool, the effect looks wonderful. Very haunting! Really great technique and perfect for our challenge this week. Thanks for joining us at Fab'n'Funky Challenges. Hope you'll be able to join us again soon. Beautiful tag, I love the script writing on the paper. Thanks for joining us at Top Tip Tuesday. Beautiful tag, thanks for joining in with us over at Top Tip Tuesday - don't forget to share a Top Tip with us next time to be in the running for our Top Tipper Prize too!